When I saw that Harold Bloom had reviewed José Saramago's last novel in a recent issue of the NYRB, I was tempted to give the book three stars, unread, on principle alone. Unfortunately, for all his bombast, ego & condescension, Bloom can be a penetrating critic, and I am forced to agree with his conclusion that "what goes wrong in Cain is...its incessant tendentiousness: it has too palpable a design upon us." 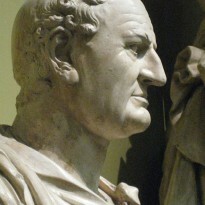 I'd like to understand Cain as the first draft of something that might have evolved into another in the long tradition of works that question God and his purposes, beginning in The Bible itself with Job and continuing into the present with the likes of James K. Morrow, Nikos Kazantzakis, Thomas Burnett Swann, Thomas Mann, etc. Though Cain acknowledges the ambiguity of life, there's no serious grappling with the issue in contrast to Mann's The Tables of the Law. In that book, there's a back and forth between Moses and Yahweh, where Moses can criticize God and God can acknowledge the justice of those criticisms. 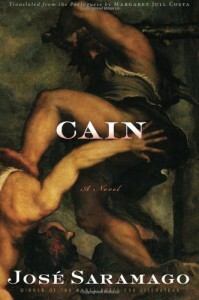 In Cain, as Bloom points out in his review, both characters - Cain & God - are crudely drawn and don't come alive. And if the potential for greatness (or goodness, at least) is there in parts of this book, the reader needs a more thorough exploration of Cain's rebellion and the wisdom he acquires in his enforce wanderings. As well, we need more than a sociopathic deity who has no greater motivation for his actions than to satisfy his ego. I can't recommend this book - rather I'd recommend those authors I mentioned above - but I am intrigued by the snippets of Saramago's Gospel According To Jesus Christ Bloom quotes in his review & may check it out. A final note that has little to do with my analysis of the book (such as it is): The annoying lack of punctuation beyond the comma, period and the occasional, initial capitalization (I didn't get lazy in the passage transcribed above; it's straight from the book). I don't know why the book is punctuated this way (ambiguous punctuation reflects life's ambiguities?). What I do know is that it posed sometimes serious obstacles to what enjoyment I got from reading the novel.